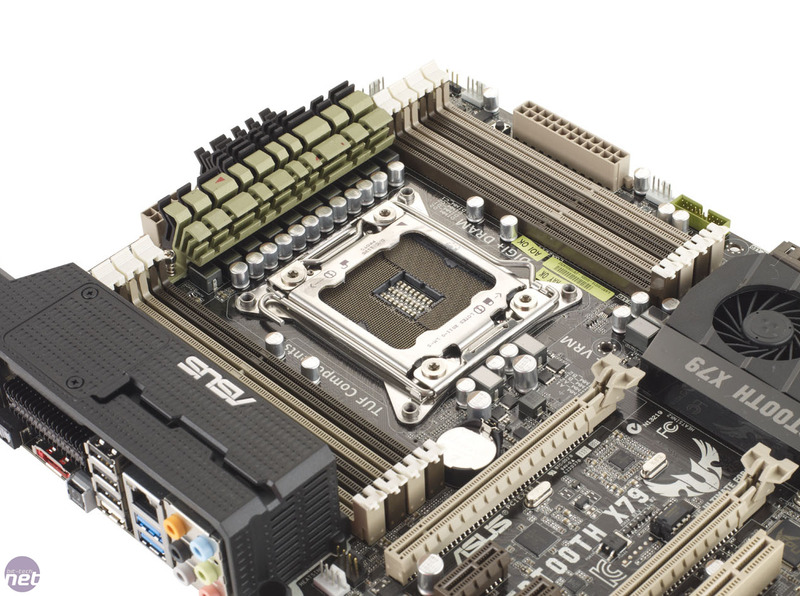 We're generally big fans of Asus' Sabertooth range of motherboards; the LGA1366 variantpicked up an Excellence award last year, and both the Intel LGA1155 and AMD Socket AM3+ models have also wowed us, thanks to a great balance of features, overclocking potential and cooling. 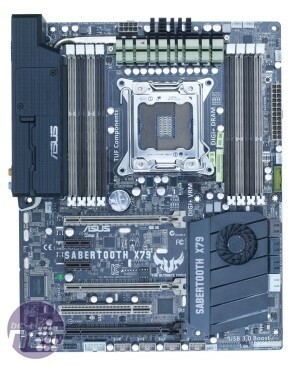 The Sabertooth X79 offers more of the same awesomeness you'd expect from this premium line of motherboards, and out of the box, it's great for providing a cool, well-featured and tweakable home for your expensive LGA2011 CPU. 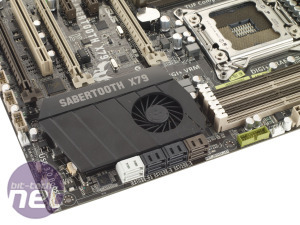 The board itself is clad in the familiar green and black heatsinks, but what immediately sets the Sabertooth X79 apart from the competition is the fact that both the VRM and Southbridge heatsinks are equipped with fans to aid cooling. While such small chipset fans have in the past been a loathsome addition on motherboards, cooling is an issue for LGA2011 motherboards. All the LGA2011 motherboards we've tested (look out for more reviews soon) become very hot, especially when overclocked, so this extra dose of chill factor is very welcome. Interestingly, you're also not forced to use the VRM fan - instead, the included 40mm fan can slot into a square recess in the black shroud that surrounds the I/O ports. 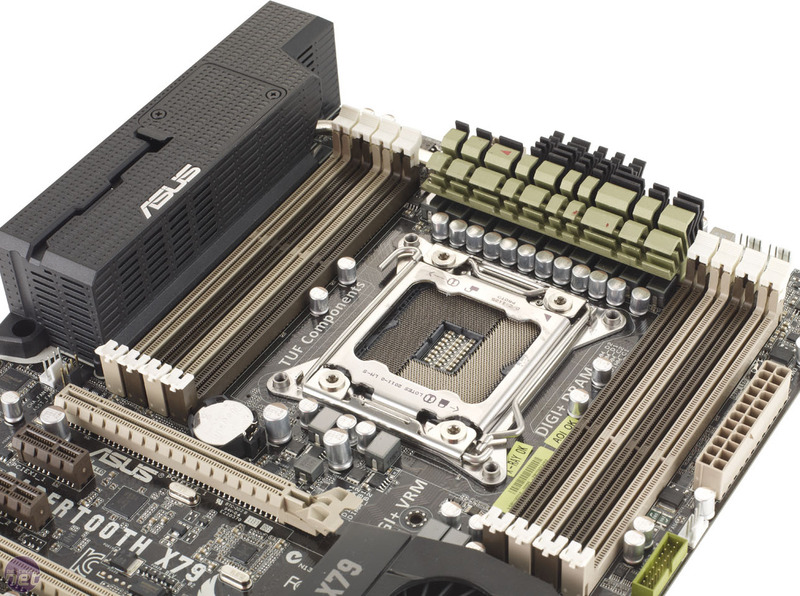 Both VRM heatsinks are also connected via a heatpipe so the fan can keep them both cool. The Southbridge fan wasn't too noisy when it span up either, but as we'll explain shortly, you can alter its fan profile using software included by Asus. 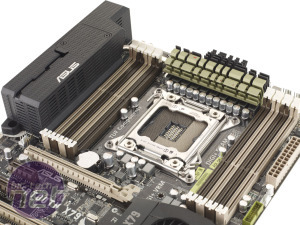 Asus' Sabertooth motherboards have never been quite as well featured in terms of overclocking buttons and switches as its RoG boards, and the same applies to the Sabertooth X79. Instead, it's geared more towards the workstation market, but still offers a plethora of settings to tweak in the EFI. It's a little disappointing, though, not to see on-board power and reset switches - overclocking aside, these are useful for testing any board before you install it in your case. There's also no CMOS clear switch or LED post readout, but there are LEDs located next to key hardware slots indicating their POST status, and the CMOS clear jumper is easy to access in the bottom right hand corner of the PCB. 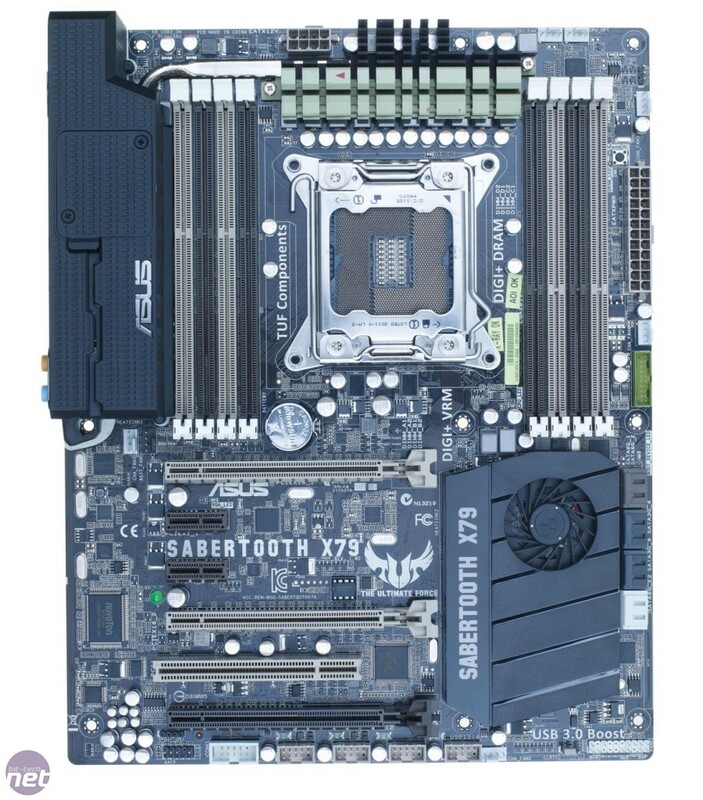 This is where the complaints end though; the rest of the Sabertooth X79 is awash with all the features that make PC enthusiasts go weak at the knees. 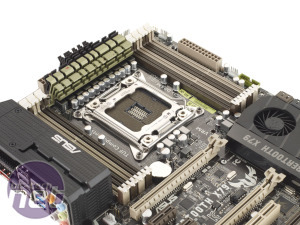 There are seven fan headers, one of which is dedicated to the optional VRM fan, and two just for your CPU cooler, should it need two 4-pin PWM fan headers. Of the eight SATA ports, four are 6Gbps with two controlled by the Intel Southbridge and two more controlled by a Marvell 9128 controller, while an ASMedia 1061 controller offers two eSATA 6Gbps ports on the I/O panel. There's also a total of six USB 3 ports - four in the I/O panel and a further two via an on-board USB 3 header. Meanwhile, Asus has opted for an Intel Gigabit Ethernet LAN port, and the I/O panel includes an odd array of coloured ports, in particular a white USB port. This is located next to a BIOS Flashback button that, amazingly, enables you to flash the board's BIOS without even turning on the PC. This is useful not just if your flashing attempt failed, but also if the board requires a BIOS update prior to installing a new CPU. 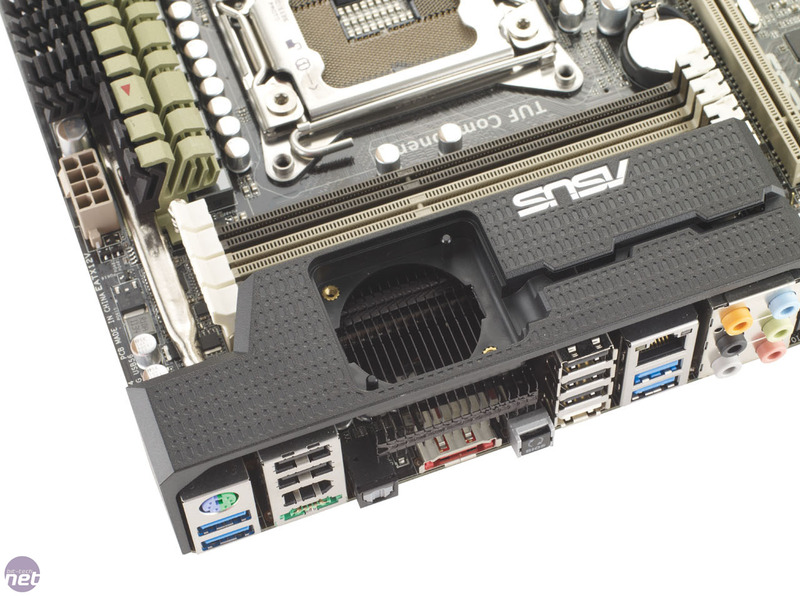 The Sabertooth X79 also sports three 16x PCI-E 3.0 slots, with two graphics cards benefiting from full 16x speed apiece, while installing three graphics cards will see the second and third slots drop to 8x. 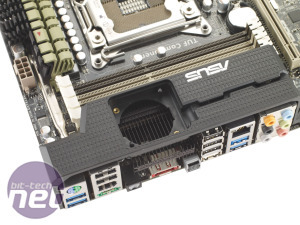 In addition to these, there's a legacy PCI slot and two 1x PCI-E slots, located in a way that means the Sabertooth X79 allows for a varied mix of sound cards and TV Tuners, even if you're planning on using more than one graphics card. 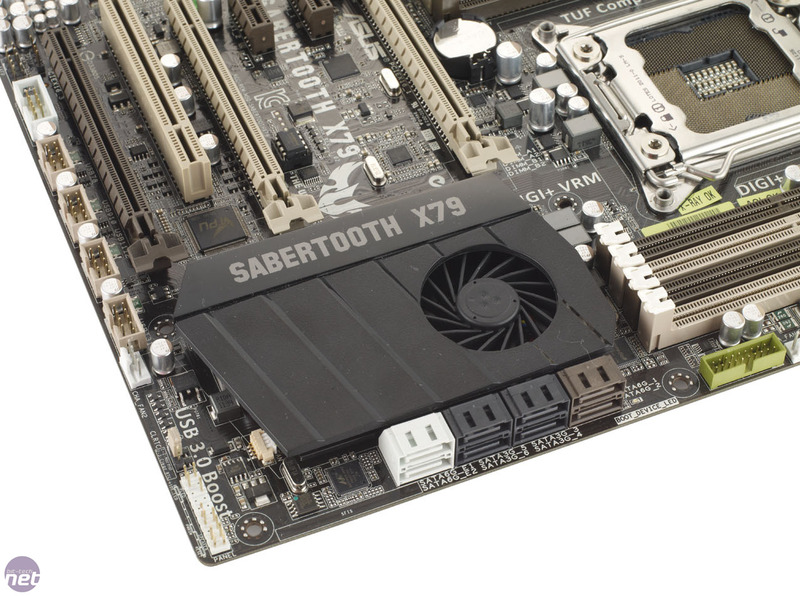 The Sabertooth X79 also gains a few Brownie points over some boards for having the full complement of eight DIMM slots, supporting up to 64GB of DDR3 memory. The PCB is crowded, mainly due to the large cooling-related items; however, there's still enough space around the CPU socket.